It is important that the Enrolment Status and even Status Reason be updated first as this may trigger tasks and processes to occur. The status you choose could depend if any additional paperwork etc may need to be completed. The End Date (and Start Date if it hasn’t been updated) needs to be modified to reflect the actual end date of the Unit. Outcome Codes and Enrolment Dates can be updated in Bulk. The status reason you choose could depend if any additional tasks or considerations need to be done. If a Learner does not complete their Enrolment you will need to change details in order to report TNC (Training Not Completed) or D (Deferral). The Enrolment Status must be changed Withdrawn or Cancelled (no penalty) or Cancelled (penalty). This will automatically report the TNC outcome under the Outcome identifier – training organisation field. Wisenet has done this in the background for you. The Enrolment Status must be changed Deferred. This will automatically report the D (Deferral) outcome under the Outcome identifier – training organisation field. Wisenet has done this in the background for you. 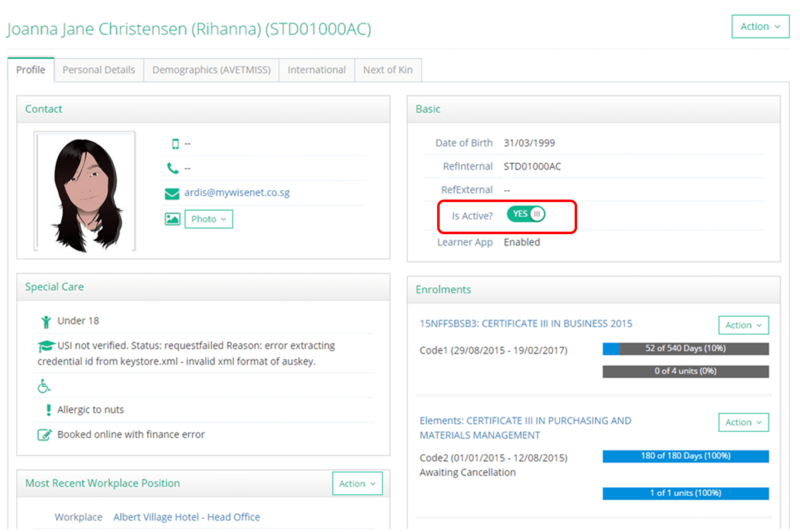 If you have NOT previously reported Training Activity Data for the superseded qualification, you must cancel the Learner’s Commitment ID and create a new Commitment ID for the current qualification before training in the current qualification starts. NOTE: This means that for transitioned students, the NAT120 file may contain multiple Program identifiers (i.e. qualification codes) and UoC details from both the superseded and the current qualification. A maximum of three Program identifiers can be reported. Once a Credential is issued you can finalise their status. If you have given the Learner access to the Learner app or they used eLearning you can now disable their access. By default, when a Learner is added to Wisenet, they will be deemed Active. You can later mark a Learner Inactive as required. This can be done at any time based on your policies once you have finished with the Learner. For some scenarios it is useful to add a note to Special Requirements and tick the Privacy Flag for greater transparency. You should ensure that you have correctly unenrolled the Learner and removed their access. Generate a report to check data and errors?